Savvy Spending: My "most pinned post": Valentine's Scavenger Hunt for Kids! 9 FREE, Pre-written clues! 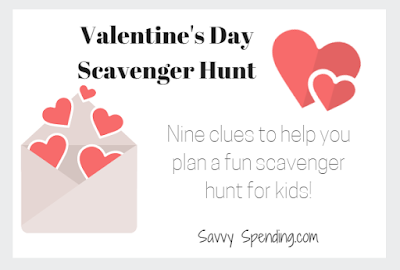 My "most pinned post": Valentine's Scavenger Hunt for Kids! 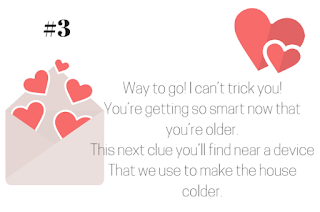 9 FREE, Pre-written clues! This post is one of my most often viewed and pinned posts of each year, so I'm resposting it again to share with any newer readers! I have fond memories of going on Scavenger Hunts throughout my house as a child. My mom would set up clues for my sisters and me to find and it made a big impression on me as a kid! 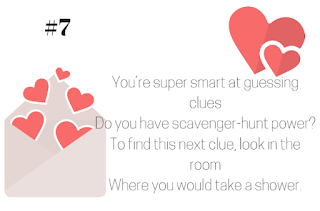 I thought my girls were old enough now to try a scavenger hunt of their own, and what better time than Valentine's Day! I picked up a few little treats for them at Target (on clearance, after Christmas) to use as their final surprise, but you don't need to spend a lot of money on this fun activity! Your final prize could be a special treat, like a homemade milkshake or cookies, or a trip to the park or to see a movie. You could take them to the dollar store and let them pick something out (my kids love to do this). For most kids, the scavenger hunt is special enough that you don't need a gift at the end, but if you have a few extra bucks to spend, it's always fun to unwrap something! Here are the clues I came up with. My kids were 5 and 7 when I made this, so I geared it for their ability level. Feel free to use my clues (I tried to use clue locations that most households have), or you can make up your own! GO HERE TO PRINT *ALL* THE FREE CLUES!! Love this! I'm excited to try it with my kiddos tonight. My boys LOVED this! We had so much fun. Thanks!! This is going to be so fun! So glad I found this!